A good quick bread should be in everyone’s baking repertoire. It was one of the first things I began baking as a girl, and through the years – as my baking abilities grew – I’ve gone back to these breads over and over again. If last minute guests are heading over, or I just feel like having a luscious loaf sitting around tempting me to take a slice: I simply mix a few things in a bowl, pop it in to bake, and allow it to enrobe my apartment with the dreamy scent seeping from the oven. Then I go and do my hair, because it needs to get did – right now. 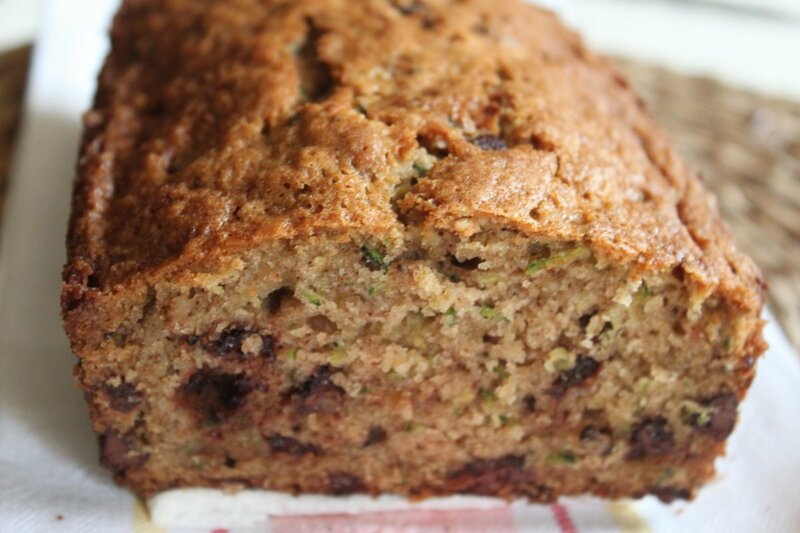 Zucchini bread has been on my list of things to make this Summer. I know we’re ten deep in the days of September, but the green market’s tables are still buckling with the copious amounts of zucchini Summer produced, and with the weather still encouraging tank tops and flip flops; the desire to make this sweet Summer quick bread wasn’t going anywhere. I swiped up a few of these super pretty zucchini this morning and headed home to make this happen. I know – it’s just a quick bread. And you’ve all probably had this version before, but I was pretty excited to see how this would turn out. Can you believe I’ve never made zucchini bread before? Actually… I can’t even recall eating it. Tragic. I was delighted with the results this recipe produced: moist, richly spiced, flavorful, and just sweet enough – not overwhelming. A slice would be the perfect cure for the raging sweet tooth I wake with most mornings. A good crunch from the walnuts and a tornado of chocolate chips whirled throughout give depth and texture to the bread, but you can totally leave them out if you’re more of a purist when it comes to these things. I plan to have a hearty slice with a cup of tea and cozy up with a book -I love Saturdays. Grease and flour two 8 x 4 inch pans; set aside for later use. Preheat oven to 350 degrees F (165 degrees C). Sift flour, salt, baking powder, soda, nutmeg and cinnamon together in a bowl. Beat eggs, oil, vanilla, and sugar together in a large bowl. Add sifted ingredients to the creamed mixture, and beat well. Stir in zucchini and nuts until well combined. Fold in chocolate chips. Pour batter into prepared pans. You take beautiful photos! Beautiful photos for awesome recipes! Thank you, Michelle! It was easy to get good shots of the zucchini – they were stunning, and baked up into quite a delicious bread. Excellent recipe! 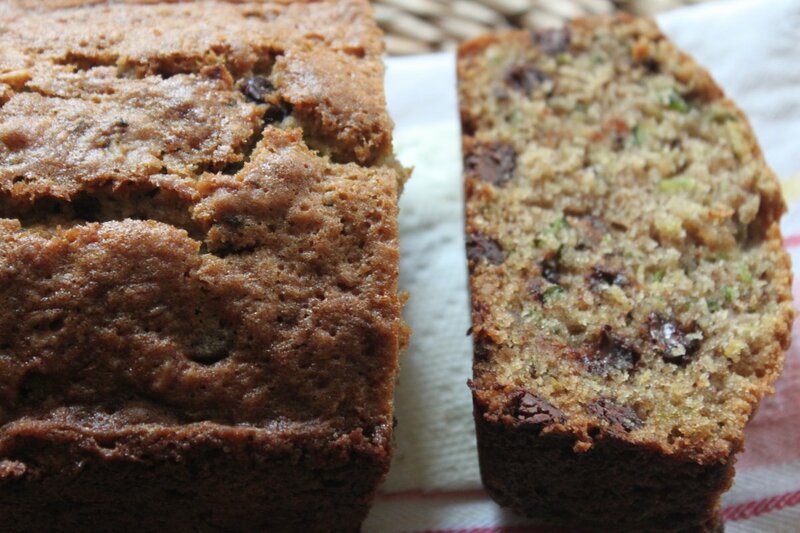 I love zucchini bread … I love chocolate … what could be finer? Unfortunately I think I should bake up the strawberry shortbread currently in my freezer before I make anything else … but this bread is definitely next in the queue! Hi Becca! It could be worse than having to bake up strawberry shortcake 🙂 sounds delicious and Summery too! I’m glad you’re putting this zucchini bread in your queue; I hope you love it as much as I did! 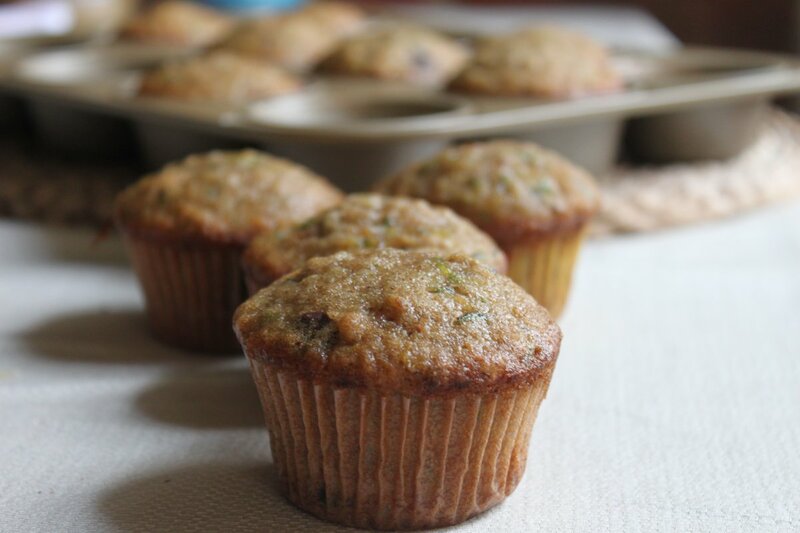 Zucchini recipes abound nowadays but I must say your loaf and those little muffins are the best ones I’ve seen so far! And the addition of those chocolate chips? Perfect. Thanks so much Maya! I loved the hefty amount of chocolate swirled throughout the bread; Chocolate makes everything better – i’m biased. Seconding Michelle’s comment – beautiful photos! I see a lot of recipes like this recently – cakes with zucchini, cakes with beetroot… makes me very curious to try them for myself! Thank you, Charles! I’ve yet to try beetroot in any cakes, although I am currently loving it on top of my hamburgers. As for zucchini, I can say without a doubt it bakes beautifully. Thank you, Junia! I am so thrilled to finally have made it, and with success! I was just going to steam or roast that zucchini in the kitchen, but now… hmm. Great recipe. Greg – do it!! Come on, we both know sweet tasty bread makes every morning a little brighter, right? I agree, a good quick bread recipe is a must for everyone’s repertoire. Zucchini bread is one of my personal favorites. Hi Jeanette! I wish I had started baking this bread years ago; it is now one of my favorite breads as well! Lovely photos! I’ve been making zucchini bread for years and never get tired of it. And, I am so right-there-with-you on that “hearty slice, cup of tea and a book”! Hi Jean! Thank you, dear – my camera and I have lots of time to play around on the weekends. Very beautiful blog with lots of mouth watering pictures! fantastic! Love this simple and delicious recipe!Thanks for sharing this! Hi Jenny! Simple recipes are the best; no need to be frantic in the kitchen when there are so many easy and delicious options to whip up! Hi Ray! I loved the texture of this bread; I think a moist loaf is very important. Hope you had a wonderful weekend! Hi Liz! Your secret is safe with me 🙂 I’m looking forward to soups and spicy curries with butternut squash – yum! —Just placed this in my Faves. We have zucchini up the ying yang. This zucchini bread looks wonderful! I love making zucchini bread and muffins! I haven’t had this in so long. I love this. Thanks for sharing the recipe. The images are amazing as well. Thanks so much, Patricia! I’m hooked on this bread for awhile; I love breads that can be breakfast, dessert, or just a snack – versatility is a beautiful thing. This looks amazing! I would have to omit the cinnamon due to allergies, but I think your recipe would be okay without it (not all would). Your pictures are a feast for the eyes! Thank you, Ann! I think you could definitely make this minus the cinnamon, maybe add an extra 1/2 teaspoon of vanilla extract for flavor. Let me know if you try it, and how it works out. Oh wow, this looks delicious. I need to try my hand at zucchini bread sometime! Hey Rach! You totally should; I am wishing I tried this bread years ago: it’s moist, flavorful, and richly spiced – making it the perfect bread for breakfast, or whenever! Hi Anne! You’re so sweet – thank you thank you! I loved this bread, and I was so pleased it turned out to be as delicious as I dreamed it would. Love zucchini quick bread, esp. when they are fresh and warm from the oven! Angie – warm bread from the oven is one of the best things in life! I love zucchinis but I never tried them this way.. Have to change that 🙂 Oh yes, I have a question for you! Can I write about your blog in my “Enjoy your food” posts..? 🙂 I would like to share some of your recipes with my readers. I’ve never heard of Zucchini Bread before, but I am happy I visited this blog and saved this recipe. Thanks so much for sharing this recipe.. my mother will love this. Hi there! Give it try – I think this bread is hard not to love. What a fantastic recipe! I love the sweet savoury combo. Hi Tandy! I cannot agree with you more – the smell beats anything a candle or spray could ever offer! Hi Raymund! I think that’s one of the reasons I stayed away so long; my mind could not accept something with 2 cups of shredded zucchini could still bake into a sweet delicious loaf. Oh, how wrong I was! Hi there! First time here, and really pleased to find this beautiful zucchini bread recipe. It’s one of my favorites. My uncle is an avid baker, and he always brings variations of zucchini bread over to family lunches. Seeing your lovely photos transported me back home (far away, sadly!) and back to happy memories. Hi Yasmeen! I’m so happy you’ve found your way over here and were greeting with zucchini bread 🙂 It’s funny how food and memory tie together so strongly; I’m glad I could help encourage some warm and happy ones from this post. Where is home originally for you? I haven’t made zucchini bread in years and what I remember never looked or tasted this good. Love the chocolate and nuts in it. 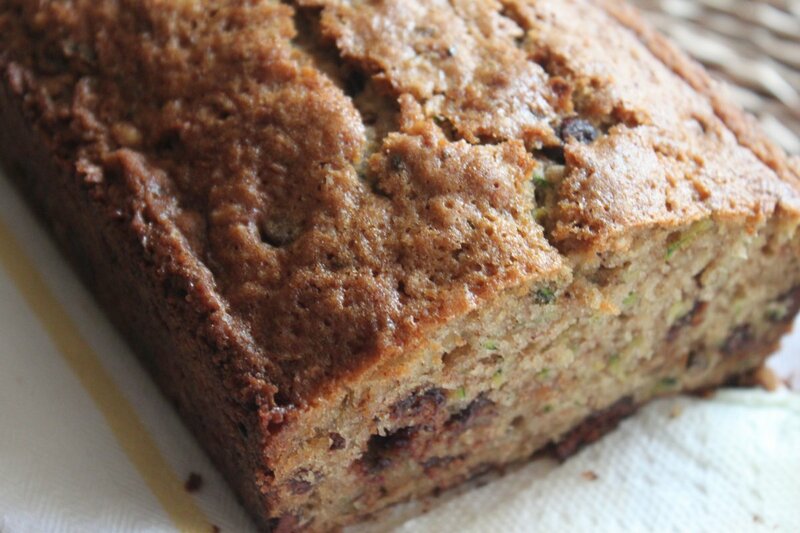 You’ve certainly raised the bar on zucchini bread. Hi Sam! I loved the addition of nuts and chocolate – gives it that extra oomph! I’ve seen some scary looking zucchini breads before, and I think that may be why I stayed away for so long; this recipe is a keeper! Mmmm, sounds delightful! I just touched down at work and I’m already missing the lazy days of the weekend! Looks delicious, wish I had a big slice now with my morning coffee! Hi Carol 🙂 Thank you, thank you! This bread definitely pairs wonderfully with a cup of coffee. Really enjoyed scrolling through your recipes here! Hi Patty! I’m glad you enjoyed your time poking around my site – always a great thing to hear 🙂 I’m excited for apples too; it’s not quite chilly enough yet to do any fall baking here. hi, this is not the first time i’m seeing a zucchini loaf but one of the best i’ve seen so far! 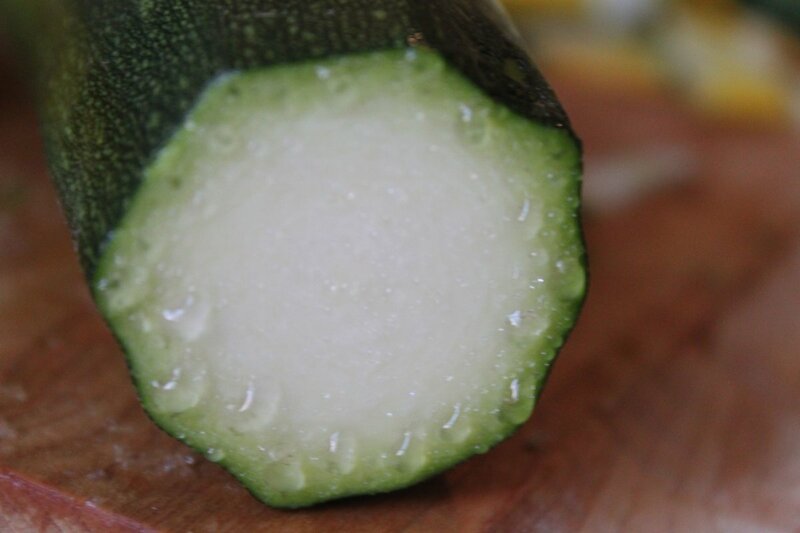 I havent tried any cakes or bread with zucchini but i know i will do it someday..You have a really nice blog! would love to drop by always! Ah, I love how versatile zucchini can be! This bread looks tasty! It was super tasty! 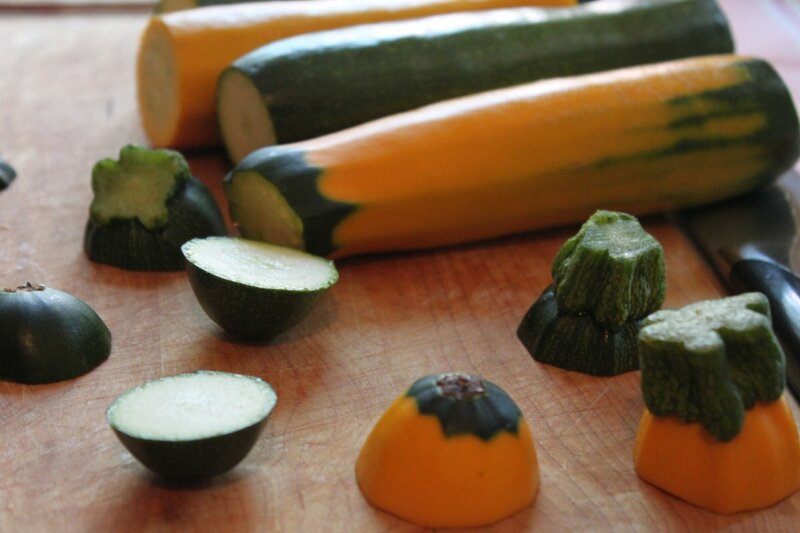 Zucchini is amazingly versaitle – love it. If you have the time (and are still in a zucchini mood), go look at my Zucchini Odyssey posts (two of them). I am generally too spacey and imprecise to be a great baker, but these two turned out really well! Oh, I LOVE zucchini bread AND chocolate so this is definitely a win-win for me! Yours looks so soft and moist! I loved the texture: moist, but firm enough to hold up a good smear of butter and jam. 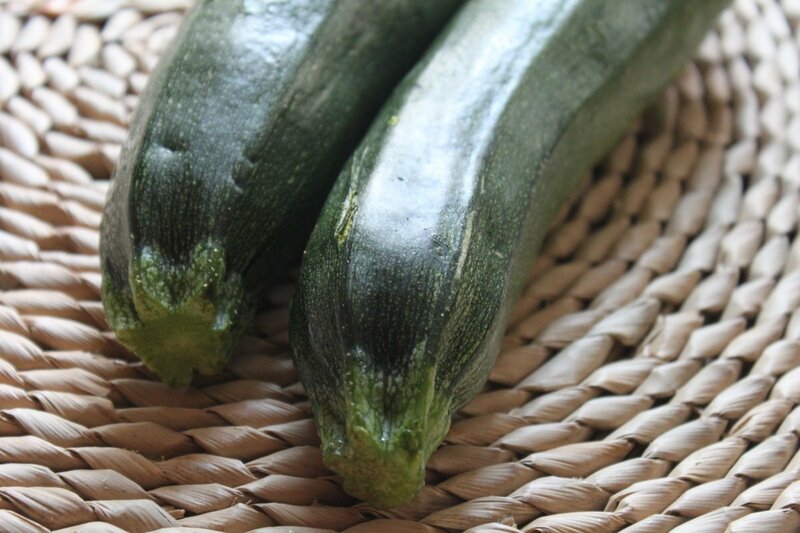 This has been on my list of things to bake for sometime now…I better make this before the3 lovely zucchinis stop growing…well, they have (almost!) and we hear apple-talk everywhere…I would enjoy this with a chilli jam and a nice hot cuppa…bliss! Oooo that does sound blissful! I’m looking forward to apple season as well, but I had to get a little bit more out of our dear Summer produce. Hi Stephanie! I know – I can’t believe this delicious bread has been hiding from me all these years; I’m so glad i’ve finally found it! Nami – You’re always so sweet 🙂 Thank you for that! I loved the chocolate chips in this, but then again, I love everything a little more with chocolate in it. Quick breads, genius things arnt they! 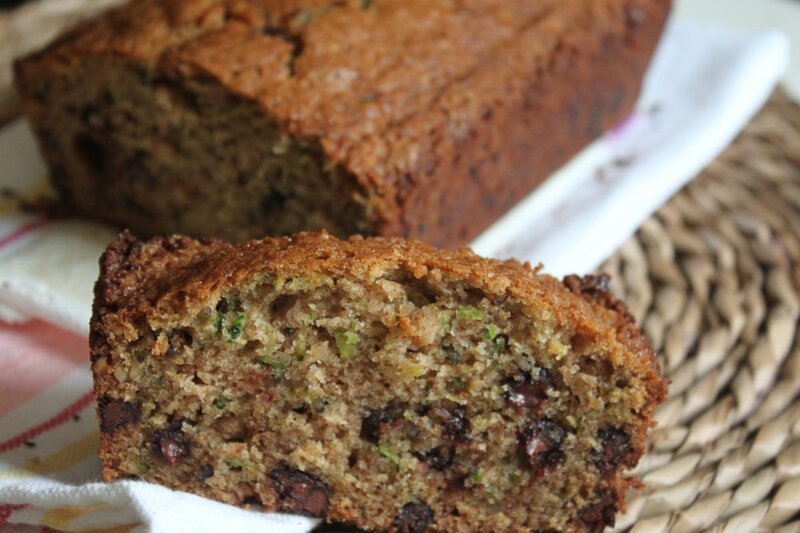 🙂 I still havnt got round to baking with our crazy amount of zucchini this year and really want to try out a zucchini bread of some kind, your addition of spices and walnuts may have just won me over 🙂 Gorgeous recipe! Thanks Sasha! The quick bread will always be one of my true loves in the baking world. A beautiful cake! So moist and tempting. Thanks Rosa! I was a bit too tempted and ended up eating half the loaf! The classic has been perfectly re invented by you..love the addition of walnuts here! Thanks so much Tanvi! I really enjoyed the crunch the walnuts added – I always enjoy a good crunch. Caroline – me too! It’s soooo sad, I just sit in front of the tv and look down realizing I ate almost an entire loaf of bread!!! The sad part is that it’s gone, of course. Given that there are TONS of zucchini still left in the market, I think your timing is just perfect! I’ve never made zucchini bread on it’s own before. With chocolate, it has to be delicious. Hi Joanne! I am so pleased the markets are still full of gorgeous produce. Hello, extended Summer!! Yay – weekend baking is the best! Do let me know how it turns out; I have a hankering you’re going to love it! How wonderful! My kids would love this for breakfast (especially with the chocolate chips :)). Kids and chocolate have an undeniable connection; I think they would love this bread! This looks fabulous!! Can’t wait to try this. Great pictures, too! Thanks, Kim!! It was superbly tasty – I wish I had a slice right now.